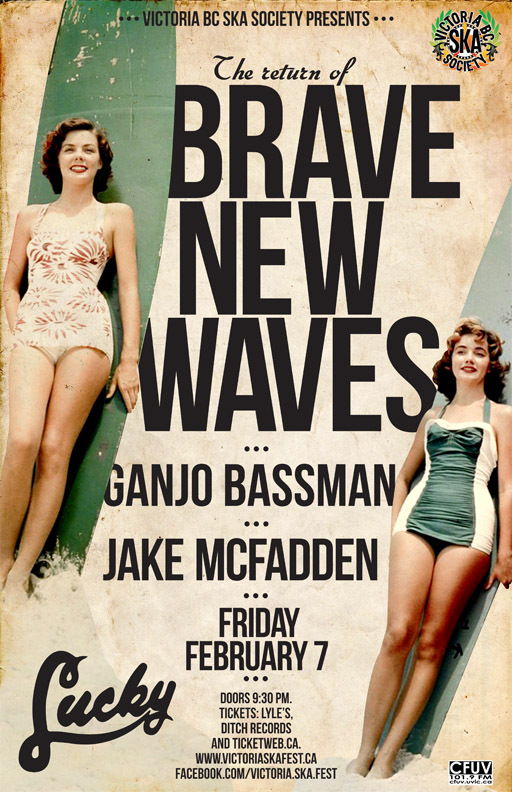 For those of you that remember it wasn't long ago that Brave New Waves roamed our cabarets all over Victoria, up the Island, Gulf Islands and Vancouver playing their own brand of beachy chilled out reggae and ska. Now after a two year hiatus from performances the band is back and ready to bring back the party to the Island's reggae/ska community. Joining them will be Ganjo Bassman - Intermational Rock Reggae Artist, Singer-Songwriter and Producer from Zapopan Jalisco Mexico. After 5 years of playing various genres with different groups, Ganjo decided to go solo and created the "2012" project releasing an E.P. It captures both the fresh sound that he's been searching for as well as his artistic versatility. The 4 song compilation takes you on a mindful journey of everyday life from partying with friends to empowerment and awareness. The music uses killer bass lines, some skanky guitar with a touch of hip-hop rhythms to create a unique blend which Ganjo refers to as "Rock-Reggae-Hop". This E.P is a sample of Ganjo's profound, yet simple style which also currently resides in more that 50 other songs. Ganjo toured in support of his EP release across Mexico, Canada, Europe, England, Italy , France , Spain joining tours & festivals in support of Ky Mani Marley, The Wailers, Alboroise, Gondwana & More, Voted "Best Rock/Reggae Band in Mexico" by RUTZ Magazine , "Video of the Week" on Hit TV, Television Azteca Mexico. Finally the show will be rounded out by Jake McFadden whose background comes from east to west where he now resides. Jake McFadden has been performing in the Victoria for almost two years but in that short time he has made connections with Victoria's ska/reggae community playing with bands such as Sweetleaf, Everybody Left, Dope Soda and Rocky Mountain Rebel Music. In addition to playing alongside ska and reggae bands McFadden has also played with producer/song writers such as Chris Velan and Fred Penner. Be sure to get tickets for this show as soon as you can because it is guaranteed to sell out!